At True Pro Quality Roofing, Inc., we are committed to using only the very finest in roofing product name. Below you can learn about each one of the products we install. If you would like to see a full line of their products, please feel free to click on their logo so that your may tour the manufacturers' website. If you have any questions or we can assist you in any way, please feel free to contact True Pro Quality Roofing, Inc. at 972-491-1830. For your convenience, you may request services from our website. ACM (American Contractor Metals) - ACM provides an extensive supply of metal roofing products and other roofing accessories. Alcoa - For over 120 years Alcoa has remained a leader in aluminum products, including an extensive variety of siding options for residential homeowners worldwide. Click on the Alcoa logo to see all of options available for your next siding and gutter application. American Slate Company - For over thirty years, American Slate Company roofing provides contractors natural slate roof products for residential roofing applications. Please click on the American Slate Company logo to tour all of the roofing application options available. Atlas Roofing Corporation - Including roofing shingles, roof ventilation and roofing underlayments, Atlas Roofing Corporation has been providing roofing contractors and homeowners worldwide endless options of roofing products for over 30 years. By clicking on the Atlas Roofing Corporation logo you can tour all your roofing options through Atlas Roofing Corporation. Certainteed - Certainteed provides an endless array of shingle options for any residential roofing project. Please click on the Certainteed logo to explore all of roofing options. 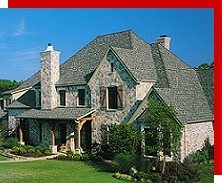 DaVinci - Since 1997 Davinci Roofscapes has been providing a variety of shake and slate residential roofing materials. The logo provided will allow you to explore all of your roofing options through Davinci Roofscapes. Decra - From tile to shake to shingles, "Feel the Decra difference" when you choose a Decra residential roofing product. Click on the logo provided to see your endless options of roofing products designed by Decra. Eagle Roofing Products - Including many "Green" options, Eagle Roofing Products offers a variety of affordable roofing products to compliment any style and budget. Your tour of the Eagle Roofing Products will provide valuable information to help you with your roofing selection. EDCO Products, Inc. - EDCO Products, Inc. are proud to remain a leader in prefinished metal roofing products for residential roofing applications. Please click on the logo provided so that can explore all of your roofing options by EDCO Products, Inc.
Entegra Tile Products - If you are considering a tile product for your new roof installation Entegra Tile Products offers a variety of tile options to compliment any decor style and budget. Be sure to also check out the "Green" options that Entegra Tile Products has for your new roof installation. Evergreen Slate Company - As one of the largest suppliers of roofing slate, Evergreen Slate Company provides many different options for your next roofing installation. Feel free to click on the Evergreen Slate Company logo for a complete roofing product listing. GAF/Elk - Since 1886, GAF has been providing residential roofing products to suit any style and compliment any budget. GAF has also been awarded the #1 visual brand by Life Magazine and rated #1 shingle by home builders and their associations. Inspire Roofing Products - Inspire Roofing Products are the next generation in residential roofing products. Inspire Roofing Products combine the natural beauty of slate with today’s technology. Please click on the logo provided so that you can view the color palette by Inspire Roofing Products. Malarkey Roofing Products - For over 50 years Malarkey Roofing Products has provided a variety of roofing products for residential roofing installations. Be sure to tour the Malarkey Roofing Products website so that you can learn more about the Malarkey Roofing Products line of roofing materials. Metal Sales Manufacturing Corporation - Metal sales Manufacturing Corporation has been providing a variety of roofing and siding products for residential roofing applications since 1963. Please tour the website of Metal Sales Manufacturing Corporation for a complete roofing product listings. Metro Roof Products - From tile to shake to shingle, Metro Roof Products has a roofing product to suit any style and budget. Please click on the Metro Roof Products logo to view all that awaits you! MonierLifetile - With over 45 years of expertise, MonierLifeTile has been providing premium concrete roof tile for residential roofing applications for many years. Please tour the MonierLifeTile website to view their products. 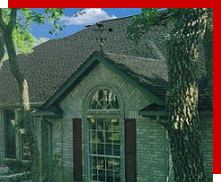 Owens Corning - Owens Corning offers an array of quality roof shingles and accessories. Please tour the website of Owens Corning for a complete roofing product listings. Tamko Building Products - Since 1944, Tamko Building Products has been providing a variety of roofing products for residential roofing applications. Please tour the Tamko website for a complete roofing product portfolio. US Tile Products - Us Tile Products provides a variety of roofing products for all residential roofing applications. Please tour the website of US Tile Products to learn more about the residential products that US Tile Products has to offer. Vande Hey Raleigh - Slate can provide you with a beautiful roof that you can be proud of for years to come. Please check out all of your roofing product options through Vande Hey Raleigh.